(written by Jen; edited by Ian) My excitement level for my first trip to Kenya was akin to my 7-year-old self's elation for her first trip to Disney World. I even packed so far in advance of my trip to Kenya that I couldn't recall what I had packed when I got there. My friend (and travel agent), Jeanie, was going on her "fam" trip to Kenya with her 4-year-old daughter to scout out properties. Jeanie asked me to join her for a portion of it. Of course, I said yes. As sometimes happens though, life likes to make the things that you are looking forward to most a challenge. Sometimes the challenge is no fault of your own, but in this case, mostly it could have been avoided or at least lessened. 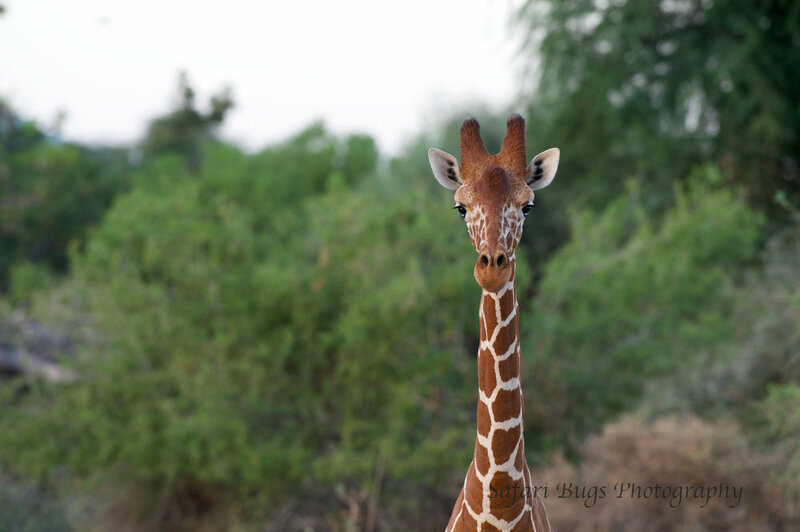 The reticulated giraffe found in northern Kenya. A few months prior to the trip, I hurt my shoulder such that I couldn't lift things over my head and had trouble sleeping. The extent of the injury was in part due to my own stubbornness. Because of the shoulder, I was nervous to make the long flight to Kenya without someone to help me with my bags and because of the pain the shoulder caused. But Jeanie would be with me once I got to Kenya, and I just had to remember to ask others on the plane for help if I needed it. On the ride to the hotel in Nairobi, I asked my guides if there was a place to stop for cold medicine. They explained that they could take me in the morning on the way to the bush plane, but in the meantime, at the hotel, ask for a Dawa, which means medicine in Swahili. So, I asked for Dawa, which came from the bar. Now, this was a surprise, but I generally like things that come from the bar. Turns out that medicine in Kenya is comprised of a mix of vodka, lime juice, honey, sugar, and sparkling water. And, sure, you can have it without the vodka, but why would you. Though it can be drunk cold, as it was a bit chilly, they gave it to me warm. After one Dawa, and a good night sleep, I thought I had kicked the cold. So, on the way to the airstrip, I forwent the stop at the pharmacy. A brilliant move by me. While waiting for my plane to the bush, I checked my camera equipment. I couldn't get my camera to autofocus. I tried all of the usual tricks--turning it on and off, taking the lens off, but nothing worked. I entered full panic mode. Ordinarily, I travel with two cameras, but I left the second one for Ian who was meeting me later in the trip in the Mara. So, I was facing a trip to Kenya without my camera. By the time I arrived at Sarara (our first safari destination in Kenya), my shoulder was inflamed, my nose was a faucet of snot, and my nerves were frazzled. I had never met Jeanie in person, and I suspect, when she saw me and heard the complaints coming out of my mouth, she second guessed her decision to invite me to join her in Kenya. I don't blame her. But Jeanie was the essence of calm and treated me as you would a 4-year -old--food, medicine, and reassurances that it will all be ok. And, it was, mostly. The cold was hideous; there wasn't much to do about that other than to keep the wine and the Dawa flowing. The autofocus issue was resolved after a few emails stateside, and the pain of the shoulder was eased with a fabulous massage at Sarara. Sarara is the perfect mix of rustic, luxury, and home. The view from the main area in camp was bliss (see the cover photo for this post)--the bush, mountains, the pool, and a water hole frequented by elephants. The camp managers when we were there were Rob, Meg, and their adorable baby Eva, who tottered around in her bare feet putting a smile on everyone's face. 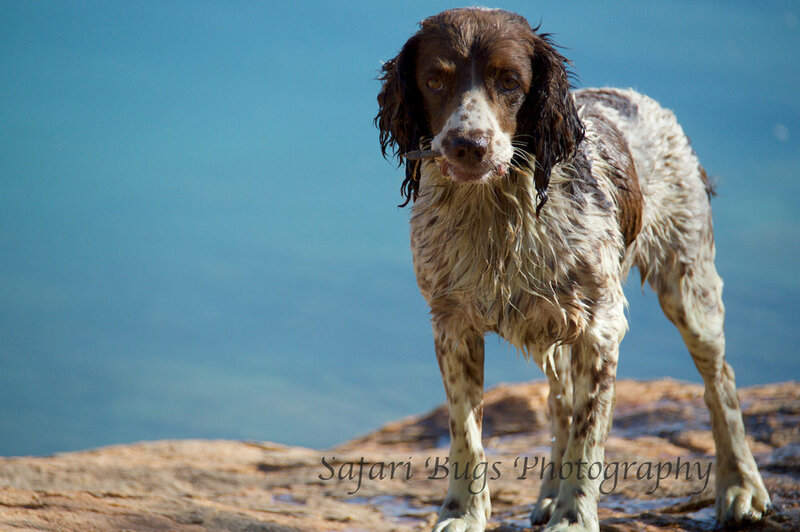 There was a resident dog who swam in the pool, and a young male nyala who had, at the time, adopted the camp as his home. The tents were spacious with great views and the open bathrooms. I said please throw the ball. That first night, we went on an evening game drive looking for the reticulated giraffe and the vulture guiena fowl, two species special to the area. We then sat at the fairly dry river bed as the sun set watching leopard and hyena come for a drink. That evening, we returned to buffalo and elephants at the camp's watering hole. For dinner, we had beef stroganhoff, which I described in my safari journal as "surprisingly good." Not sure why I felt the need to add "surprisingly" other than I don't normally eat beef stroganoff. After dinner, I was looking forward to a good night's sleep, but as often happens in the bush, the animals had a different idea. In this case, buffalo rustling through the dry foliage for hours. There were hundreds of cattle, goats, sheep, and donkeys coming to the wells, while their herder sang a song directing them to the proper well. Other than a few playful moments between cattle of different herds, the herds stayed at their singing well. Other herds wait their turn for a well under trees. 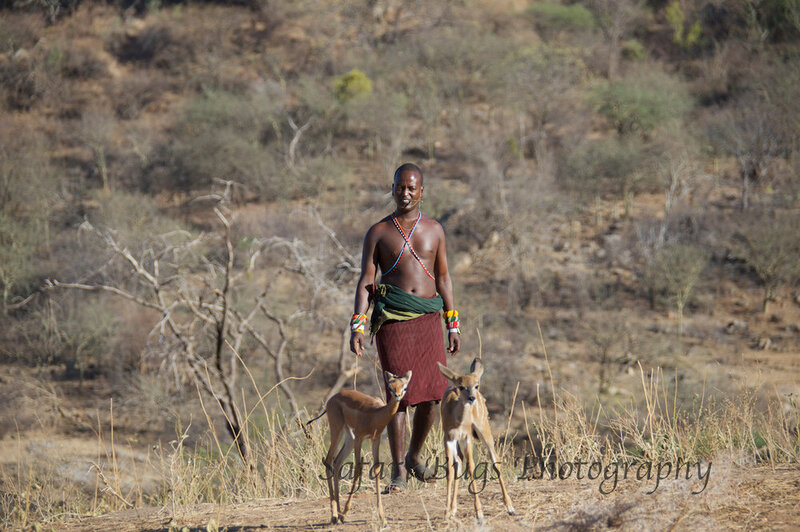 Our Samburu guide explained that girls are ordinarily responsible for the goats as girls are more responsible (didn't need to tell me that), and goats are more susceptible to predators. Game animals and predators also frequent the wells, but only in the early mornings and evenings when the herds are gone. 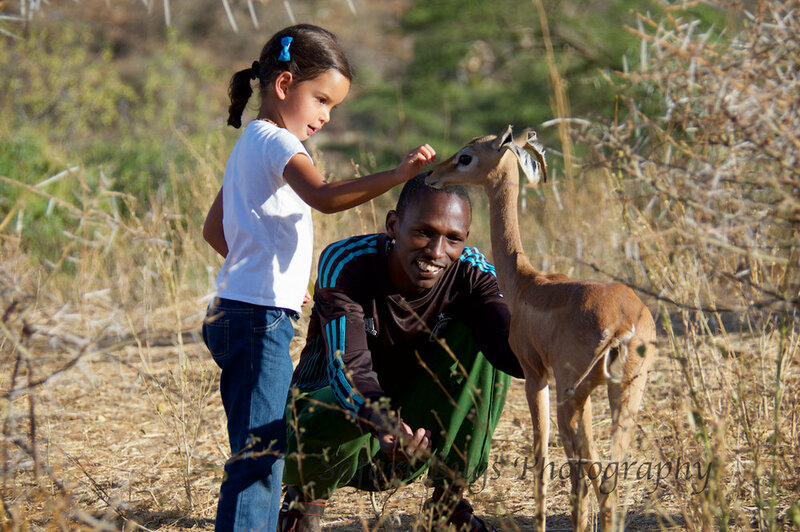 That evening, we visited the camp stables where they had an orphaned baby kudu and baby gerenuk. It was a great, and unique, opportunity to see these game animals up close. After tearing Daniela and I away from the baby animals, we took a drive down to the river to see what was prowling about now that the herds were gone from the singing wells. It was a fruitful evening--giraffes, elephants, and a leopard. For dinner we had rice, cabbage, and Indian spiced lamb, which was very flavorful and had great spicing--pretty big compliment coming from me as I do not ordinarily eat lamb. The next morning, we had a leisurely breakfast and rested up for our two-hour drive to the Lewa Conservancy on the Pan-African highway which runs from Cape Town to Cairo. I loved experiencing Sarara with Jeanie and Daniela. And Sarara is definitely a safari location I want to share with Ian in the future. 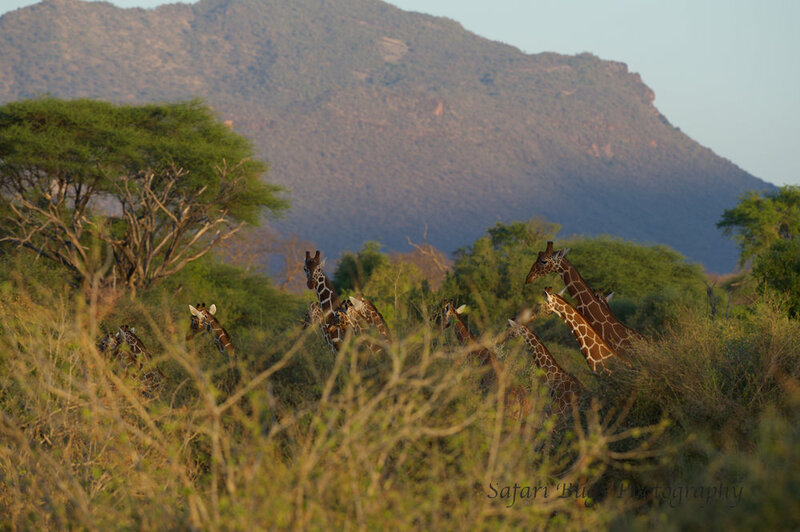 There is plenty of game to see at Sarara, but this destination is so much more than that. It's rich in history and culture. In addition to the singing wells, there is a Samburu village to visit. The camp is luxurious, and if you just want to relax, you don't ever have to leave the camp to be satisfied. And for those who just can't sit still, you can walk or ride through the bush on a bush pony. I've since learned that there is also an elephant sanctuary a short drive from the camp that guests can visit for a small donation. 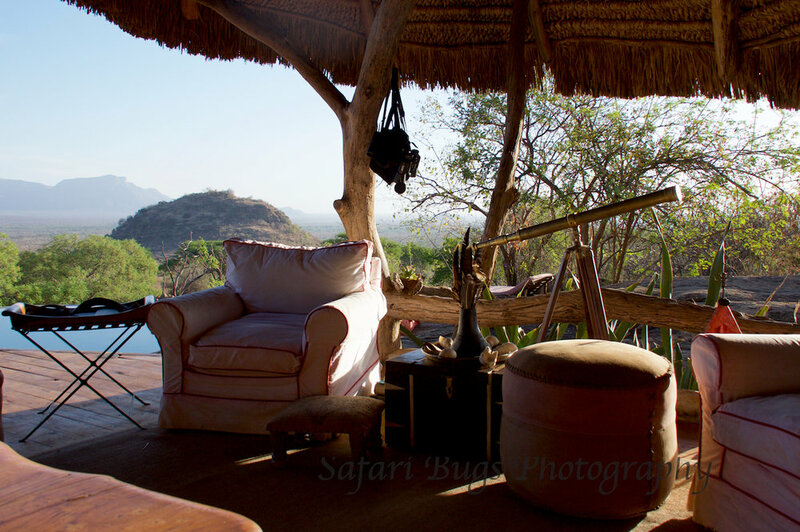 For me, Sarara is best summed up by what I wrote in my safari journal while there: Sarara is a luxury tent experience at your best friend's amazing house in a stunning location. P.S. 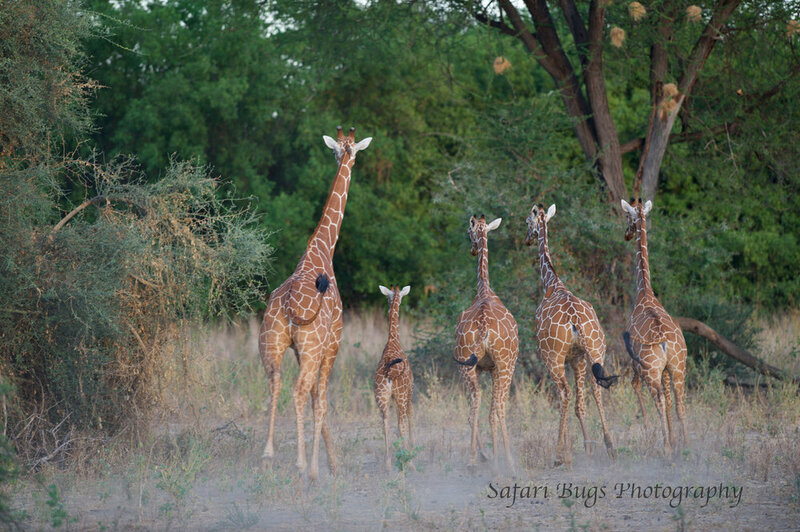 The trip to Sarara was planned by our wonderful travel agent, Jeanie Fundora at Travel Beyond. Jeanie has been planning trips to Africa for 18 years and has been named by Travel + Leisure magazine to its prestigious A-List for her expert knowledge in Africa, having traveled to Africa 22 times. Jeanie is as a fierce advocate for her clients, making sure every need is accommodated on diverse trips from honeymoon safaris to multi-generational family safaris in both East and Southern Africa as well as India. If there’s a way to make out-of-the-ordinary details work, Jeanie will find it. P.S.S. My brother, Steve, provided editorial support, i.e., finding my numerous typos. And, of course, Ian provided invaluable content for this blog and is my favorite travel companion in life!